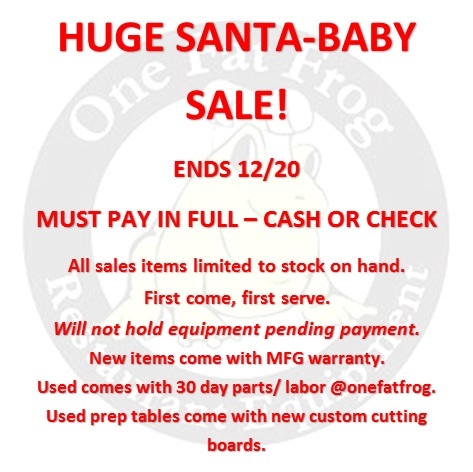 We are having a CRAZY sale at the Frog and I have to tell you, people are going mad about this restaurant equipment! I even saw someone try to buy the Don… I’m sure if they would have baited him with cookies and “free” trips to Key West, he would have willingly got into the bed of that truck. I know the list is already posted here, but I’m going to talk about this TWO DAY SALE one more time. Since tomorrow is the last day. And hey, if you purchase a NEW walk in cooler or freezer, you will receive a $500 credit toward your next purchase! Or purchase NEW 27” refrigerated make table for $700! These are AMAZING prices! There are a few stipulations, of course, but I made this handy picture for you so you had something pretty to look at while you read the fine print. Aren’t I generous?